Watch Tinie Tempah and Jess Glynne hit the streets of London in the summer anthem's video. 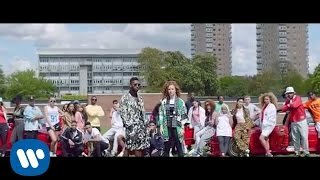 Tinie Tempah has dropped the official video for his Jess Glynne-assisted comeback single 'Not Letting Go', the first from his forthcoming third album. The track is the first single the London MC has released since his 2013 album, 'Demonstration', although he did drop a collaboration titled 'Peak' featuring Stormzy and Bugzy Malone earlier this month. The video was shot entirely in London and shows Tinie and Jess hang out on the fields with friends, with famous sites such as The Shard gleaming through in the distance. "I wanted to make a song that captured that London summertime feeling which is always the best time of the year for me and the time where I've had my most romantic experience," explained Tinie. Watch the London-set video above.